During those workshops we will see how exactly we can compose multiple traits and how they this mechanism solves so called "Diamond Problem.". To have a comparison let&apos;s first check similar mechanism to traits which is available in java8. In this version of java you can have a default implementation of an interface method however when two interfaces have the same method with default implementation you are the one responsible for solving this conflict. In Scala this is solved differently. You can easily inherit from multiple traits and call super in each one. 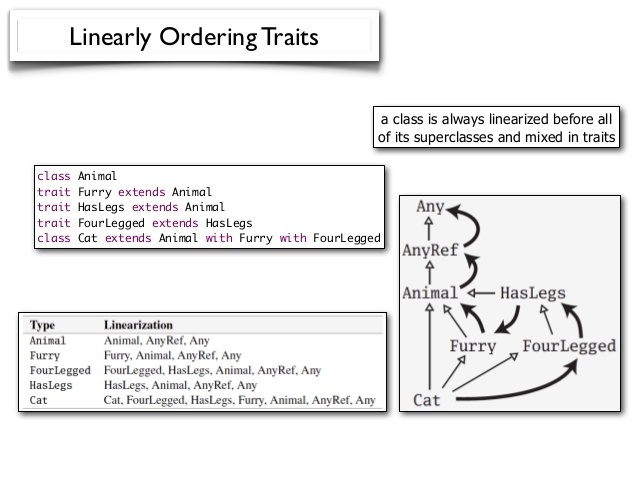 Scala will rearrange traits from right to left. override def handle(r: Request): Response = ??? and for the rest returns 404.
abstract override def handle(r: Request): Response = ?? ?